Severance is a satire about immigration, 21st-century office work ... and also the apocalypse. Candace Chen, the daughter of Chinese immigrants, is a production coordinator for a Bible manufacturer in China. She works out of New York and when a fatal disease wipes out most of the U.S. population, Candace is the last one left at the office. Those who fall ill with Shen Fever perform repetitive tasks until they drop dead — a mother resets the same table over and over, retail workers fold and refold their wares. "It typically takes some action from their former lives and forces the victims to repeat it," Ma explains. Shen fever is named after Shenzhen, China which is a manufacturing hub. I was thinking about factory work and the nature of the repetitive actions of factory work — just the same gestures over and over. And I was also thinking [of] Candace's ... work routine — waking up, making coffee, getting on the train, getting to the office — just that repetition. I wanted to somehow unleash that and maybe exaggerate it and amplify it somehow upon the whole world. This novel started as an apocalyptic sort of short story and I had a lot of fun sort of just knocking things over, destroying things ... just thinking about how the buildings might stop working, and how the public transit might slow down, and how people would have to stop working. To me, it was a very gleeful short story but there was also this undercurrent of anger and I tried to source that anger back to its origin which had to do with work, which had to do with capitalism, which had to do with working in an office. When I immigrated to the U.S. at the time I was an only child. I was a product of the one-child policy. And I remember that one of my mother's fears was that something would happen to herself or my father. I would be completely estranged in this country and that if I lost touch with my language, with Mandarin, if I lost touch with Chinese culture, even if I were to try to return to China it would be really difficult. So I think in a way I had Candace Chen embody my mother's fears. How do I make the effects of global capitalism more visible? Often when I buy a shirt or something from H&M I'm completely cut off from the manufacturing side of things. I don't know how things are made. I don't know [how] they're shipped. I don't know the personal toll that it takes to make something — and I wanted that to be more visible. And I wanted that to be like a disease that inflicts the world some way. Connor Donevan and Jolie Myers produced and edited this interview for broadcast. Beth Novey adapted it for the Web. 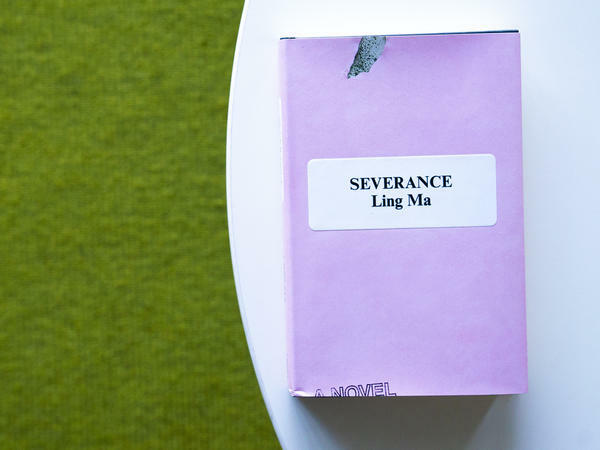 The new novel "Severance" is about immigration and 21st-century office work and also the apocalypse. The main character, Candace Chen, is a first-generation American whose parents came from China. When a fatal disease wipes out most of the U.S. population, Candace is the last one still at the office. 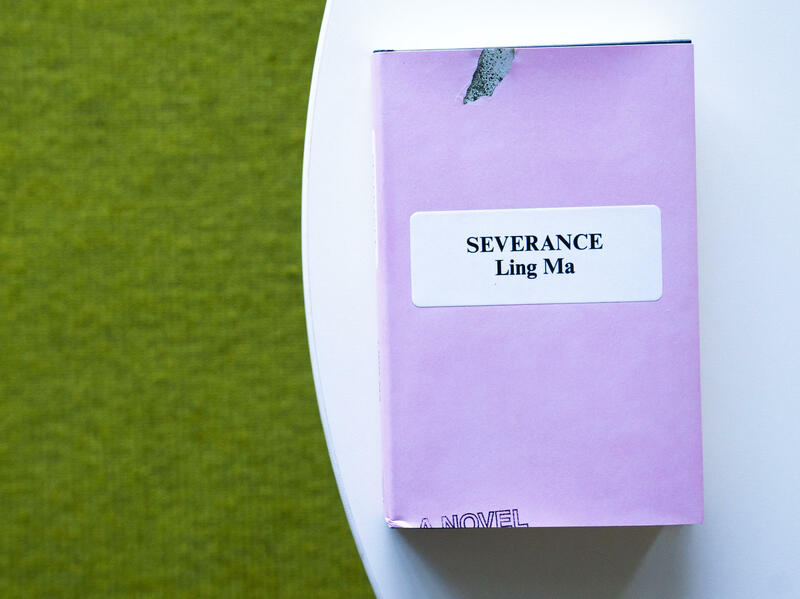 This is the first book from the author Ling Ma, and it started out as a short story. She told me that imagining the world falling apart - the office buildings, the subways, people's daily routines - was actually a lot of fun. LING MA: To me, it was a very gleeful short story. But there was also this undercurrent of anger, and I tried to source that anger back to its origin, which had to do with work, which had to do with capitalism, which had to do with working in an office. SHAPIRO: Yeah. The apocalypse is almost a tool that forces people to stop doing the kind of work that otherwise they would keep doing until they retire or drop dead, it seems like. MA: Yeah. Liberation (laughter) finally. SHAPIRO: Apocalypse as liberation, yeah. SHAPIRO: But there's something about this disease, too, Shen fever, which manifests itself in the kind of repetitive activities that seem to reference the kind of drudgery work that you're also talking about in the novel. MA: Yeah. So Candace is a production coordinator of Bible manufacture in China. She works out of New York. And I was thinking about the repetitive actions of factory work, just the same gestures over and over. And I was also thinking on Candace's side, like, her work routine, waking up, making coffee, getting on the train, just that repetition. And I wanted to somehow unleash that (laughter) and maybe exaggerate it and amplify it upon the whole world. SHAPIRO: So describe the symptoms of Shen fever. MA: So the victims of Shen fever are typically locked into, like, a loop of routine. So, for instance, a mother setting the table might keep resetting the same table over and over again. SHAPIRO: And what's so creepy about this is that it doesn't seem that far off from behaviors that we all engage in every day, whether that's scrolling through Twitter or clicking on email or whatever it might be. MA: That's right. When I wake up in the morning and I'm on my smartphone, like, right away, I ask myself that. SHAPIRO: There's a moment where Candace's boss at this publishing house where she works says, you're young. You're maybe under the impression that everyone gets to do what they want for a living. You might be unhappy here, but you're not going to be happier anywhere else. MA: That's right. What are the other options (laughter)? SHAPIRO: Did you ever have a job where a boss might have said something like this? MA: Not to me personally, but I've had many jobs where I wondered the same thing (laughter). I actually started this novel in the last months of my last office job. MA: Yeah. So the company I was working at was consolidating their offices, and as a result, they were letting a lot of employees go. And just watching that was a very eye-opening process. And so I just started writing this at work (laughter). SHAPIRO: Did you feel lucky not to have been laid off, or did you feel jealous of the people who were forced to do something other than the drudgery they'd been doing for decades? MA: Oh, I was laid off (laughter). SHAPIRO: You were laid off. MA: Yes, I was laid off. SHAPIRO: And was that liberation or punishment? MA: I think the first two weeks are absolutely liberation (laughter). I got on my unemployment, and I called it my arts fellowship. MA: But after that, the question of what to do and the reality of it starts to sink in. SHAPIRO: At one point, I wondered as I was reading this description of Shen fever coming over from China whether you were writing an allegory about globalization and in favor of closed borders. MA: I'm not sure if I thought too much about closed borders. But what I did think about is how do I make the effects of global capitalism more visible? Often when I buy a shirt or something from H&M, like, I'm completely cut off from the manufacturing side of things. I don't know the personal toll that it takes to make something. And I wanted that to be more visible, and I wanted that to be like a disease that inflicts the world in some way. SHAPIRO: Your main character, Candace, is the daughter of Chinese immigrants. Your family came to the U.S. from China when you were a child. Do the similarities between you and Candace extend farther than that? MA: Candace and I do share some biographical details, but we're very different. Like, for instance, a key difference is, like, my parents are still alive. But I do remember when I immigrated to the U.S., one of my mother's fears was that something would happen to herself or my father. I would be completely estranged in this country, and that if I lost touch with my language, if I lost touch with Chinese culture, even if I were to try to return to China, it would be really difficult. So I think in a way I had Candace Chen embody my mother's fears. SHAPIRO: Because Candace is very much cut off from - her parents are no longer alive. She doesn't have a firm grasp of the Chinese language. She's losing that connection. MA: Yeah. And I think this is a specific fear that many immigrants have for their children. SHAPIRO: A lot of apocalypse stories wrestle with meaning-of-life questions. Why am I still here when others are not? What's the purpose? What's the point? Was writing this a way to explore some of those questions for yourself? MA: Yeah. I suppose in a way I was trying to figure out how does one make a meaningful life in this capitalist system? And Jonathan, who's Candace's boyfriend, he lives like a typical artist, and he doesn't own very many things. He thinks that it's possible to opt out of the system in a way. And for Candace, it's just not reasonable to her. SHAPIRO: How difficult was it for you to opt out and instead become a novelist? SHAPIRO: You might take an office job tomorrow. Is that what you're saying (laughter)? MA: Yeah. I just knew that I wasn't going to go into another office job for at least a long time. And it was strange because as more and more employees were searching for other jobs, they started to slowly leave, and the office that I worked in became more and more silent and desolate (laughter). And it felt really strange, but it also felt like all of the rules were broken. MA: Like, I would come in and the IT department would give me, like, a glass of champagne at 9 in the morning and a doughnut. MA: It was really fun. SHAPIRO: Well, it sounds like you have the best of both worlds. You have all the benefits of surviving the apocalypse without seeing the entire civilization around you crumble and everyone die. SHAPIRO: Well, Ling Ma, it's been great talking with you. Thanks so much. MA: Thank you so much, Ari. SHAPIRO: Her new novel is called "Severance." (SOUNDBITE OF COUNT BASIE ORCHESTRA'S "TOPSY") Transcript provided by NPR, Copyright NPR.